Yup, we're creationists and it's very hard to find resources these days that are appealing and hold to our view of how the earth came into existence. Most book titles I see on the subject matter are rather poorly done and uninspiring. I'm perpetually disappointed by the resources that I have found thus far. Not so with Kids' Guide to God's Creation ! I'm pleased to say that this book is not only visually appealing but holds to a consistent creation world view throughout the entirety of the book. Published by Barbour Publishing, this book opens well by first presenting the creation story which you can find in Genesis chapter 1. After detailing the scriptures upon which this book is based, the book then continues to provide information on the variety within God's creation. The chapters are divided up into the seven (literal) days. For example, Chapter 1 is entitled, "Day 1, Part 1: How it All Started - Heavens, Earth and Water." The book quotes the scriptures referenced for the first day of creation and then goes on to explain scientific information about space, the size and shape of the planet Earth, the layers of Earth, the gift of water, etc. Along the way you'll find "That's Amazing!" facts scattered in, which includes historical and scientific facts on a variety of topics relating to the subject in focus for any particular chapter. 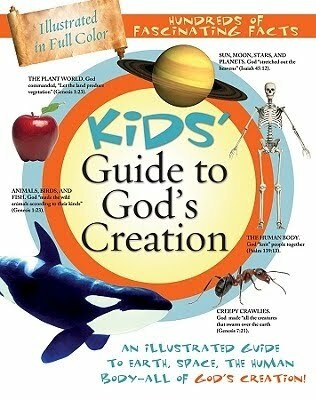 Kids' Guide to God's Creation is not only informative but it is also visually appealing, which I consider to be a huge plus. (In other words, no 1970's illustrations.) This book is loaded with full-colored photographs that are laid out in an attractive manner. (Have I said I'm impressed with this book? I'm impressed with it.) After hunting high and low for an informative book that is presented in a way that would make a child actually want to look inside of it, I'm happy to have found this particular book. I highly recommend it, especially for grade schoolers who need something more than a "God created the world" statement and yet is still easy to comprehend. It's laid out in chapter book form and almost feels text-bookish. Except it isn't. Either which way though, I'd still be happy to recommend it to you. It's quality and I like that. 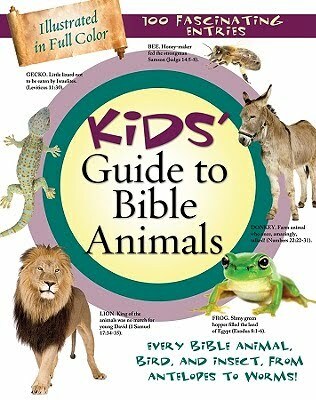 Also by Barbour Publishing is a Kids' Guide to Bible Animals . Also illustrated in full-color with real life photographs, and presented in a crisp, clean manner, this book describes the many and varied animals that you would find listed in the Bible. From the ant to the worm, the animals in this book are listed in alphabetical order, giving you both scripture references as to where the animal was listed as well as basic scientific facts about said animal. Of course I thought referencing the Leviathan was the most interesting. (Obviously there is not a full-colored photograph for this one!) There is however a detailed description of it, verse by verse, as listed in the Book of Job. Filled with lots of fun facts, this book is a winner for any animal lover in your family as you walk through the scriptures and learn more about the how and why each animal might have been listed, or what it's use was in Bible times. I have to give a thumbs up here as well. I'm very grateful to Barbour Publishing for bothering to want to put together and present resources for Christian parents that are sleek and professionally presented. I'm so tired of the sloppy half hearted attempts at providing parents with valuable resources. As Christians, we should want to create and pursue quality and well-designed creative items. After all, if we are indeed created in the image of God, then we have a gift for creativity. I'm delighted when I see people using their gift for the glory of God and in this particular case I believe Barbour acted quite well in putting these together. So my thanks to them (for the resources in general and for sending them my way specifically so that I could check them out!) and my recommendation to you! These look outstanding! More to mark on my wish list. . . :D Thanks for sharing! These look amazing! We're also Creationists and I know exactly what you mean about the challenge to find attractive and well-thought-out materials. A certain little animal lover in my house has a birthday next month, these just might be wrapped up for him. These both look like great resources! More books we just HAVE to have! These do look good. I only knew of Answers in Genesis/Ken Ham as a good resource...here is another!! In the unlikely event that I ever have children, these are good to know about. Do you mind defining "creationist"? As in "believe the universe is 10,000 years old and was created in seven literal days" or "believe God created the Earth and Universe. As in - believe in the seven literal days, young earth. I looked at the book on Amazon (what Amazon lets me see) and I'm satisfied. I don't think it fits the 10,000 year model well but that's what I like about it. It talks about things like the speed of light, how far astronomers can see across the universe, and how long light from the sun takes to reach us.-It doesn't claim that God created the universe with the appearance of age, the only possible alternative (in my view) to the view that the universe is much older than 10,000 years. This looks like a good resource, Carrie. We've studied animals this year so far, but next year we're on to earth science. I'll have to give these a look! Taia - It actually IS pretty straight forward. The introduction specifically states that it was a six-day creation. It makes the statement, "No one knows how old the earth actually is - only God does" but it doesn't debate an actual time line. (Regardless, I'm of the opinion that we're on a rather young earth.) It is incredibly explicit that the earth was created in six literal days and divides the book up as such - which for purposes of children and their stage of development - is my chief concern. I'm a strict literalist on the 6 day bit and I'm glad to have a resource that teaches that. At any rate, you are welcome to browse my copies if you like! I was looking for something like this to read to my kids. Thanks. I struggled with the six day account for about 10 years, from the time I noticed the sun wasn't created till the fourth day. I don't believe the six literal day interpretation of the Scripture is the correct one because I expect God's natural revelation about the universe to accord with his special one, but it's not a salvation issue. I suppose all our questions will be answered at the end of time. I am a young earth creationist as well. I was wondering if you had any previous reviews or comments on books/curriculum from Answers in Genesis. I would be very curious to know what you think. I am definitely going to look into the books you mentioned. Thank you for all your reviews! They are very informative and entertaining!